I am occassionally asked to offer my views or opinions in the local or national media in Australia. Sometimes it's simply the view of a dive professional working in the Queensland diving industry, sometimes it's an expert opinion on a scuba related story. Occassionally I do propmotional activities such as the 2013 Earth Hour promo dive in Reef HQ's Predator tank with the Mayor of Townsville. I've collected most of them here. My name often gets misspelled, my nationality erroneously reported, and my Instructor status confused, but what can you do? A recent interview with Dr. Denise Blake and myself on ABC news discussing the legislation regarding carrying sufficient oxygen on dive boats. New research indicates that decreasing the flow rates of oxygen given to divers with suspected decompression illness may be more damaging than previously thought. Post by Townsville Hospital and Health Service. However, the number of divers is not specified, thus leaving a bit of a grey area. If you're interested in learning more about Oxygen administration, specifically as it applies to work environments, click here. I am one of many people who believe strongly that our marine environment needs protecting in order for the reef and its inhabitants to not only survive, but to flourish. The Coral Sea, off the coast of Queensland, Australia, is not only my backyard, but is also one of the last places on the planet where large pelagic animal numbers haven't yet been drastically reduced. 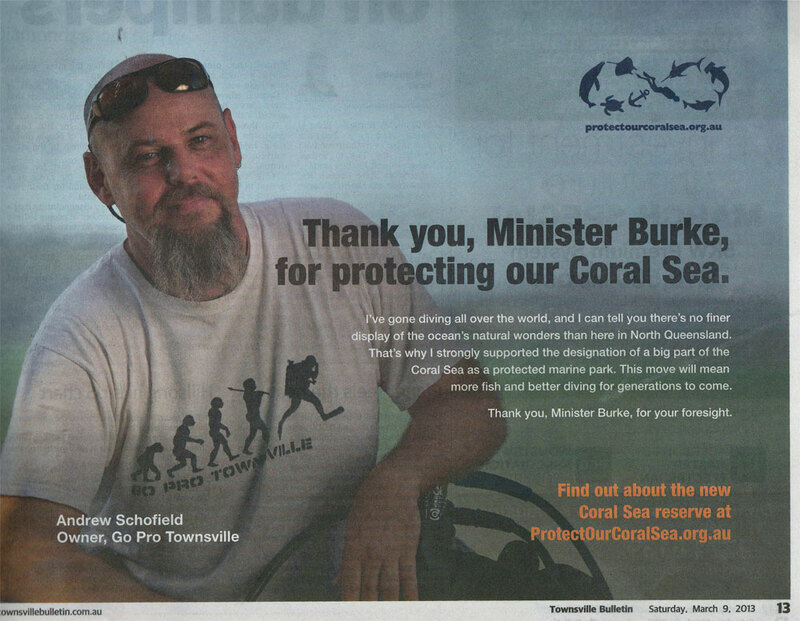 When asked if I would be a part of the ad campaign for the Protect Our Coral Sea movement, I gladly agreed. Please join me in supporting this cause. 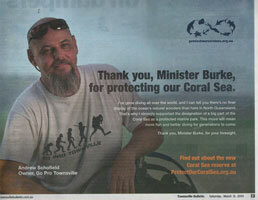 For more information please have a look at the Protect Our Coral Sea website, or the PEW Charitable Trusts website. Helping out Dr. Andrew Chin, a research scientist at JCU, mate, and shark expert extraordinaire in pulling the winning name from the hat for the Great Porcupine Ray Hunt competition. For more info on the project, please visit his Facebook site. Post by The Great Porcupine Ray Hunt . . . The procupine ray (Urogymnus asperrimus) is a distinctive species found in the Indian Ocean and Indo-Pacific, including locations such as Ningaloo Reef and the Great Barrier Reef. However, virtually nothing is known about its biology, ecology and habitat use. Maybe divers can help scientists to fill in the blanks . . .